I don’t know how to say this word, so I’m just going to pretend that I know how to say it. That’s how creationist Megan Fox opens her self-styled “audit”of the exhibits of the Field Museum of Natural History in Chicago. This homeschooling mom’s video recently went viral, and offers insight into the minds of people outraged at the idea of science museums. An audit implies a power relationship, and Fox has come to the Field on a mission to put those scientists in their place. But right at the start she needs help to pronounce the word “eukaryotes,” a term which most every high school biology student knows. Though she fumbles with the pronunciation, Fox proceeds to tell her audience how those scientists have eukaryotes all wrong. ‘Eukaryotes are different from other cells because they have a nucleus which contains the cell’s DNA’ blah blah blah. Blah blah blah? This is the important part of the definition of eukaryotes, not some useless dross. It’s hard to understand how this vital information deserves the yada yada treatment. ‘At first, all eukaryotes were single-celled and many still are today.’ What?!? If many still are today, then that would support the theory that they had never changed, that they have always been as they are today. Not that they started some place else and then are here, but they were always this and still are today. This makes no sense. Fox’s toxic tirade is the perfect intersection of the unwatchable and the unlistenable, like an Iggy Azalea music video. Her scientific mistakes are so egregious it’s almost physically painful to watch. 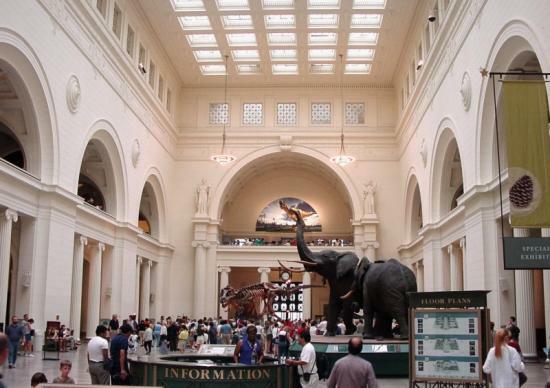 Museums and zoos and parks are a rage flashpoint for many creationists. Fox’s thirty-minute diatribe at the Field Museum, and another one at Brookfield Zoo, are echoes of other videos, such as this one where a creationist at Grand Canyon bemoans that taxpayers—presumably tricked by evil atheists—have paid for a “Trail of Time” path based on the assumption that rocks are millions of year old. The nerve of the National Park Service to make exhibits using science! There’s nothing quite like seeing your ignorance contradicted in public to raise your ire and indignation. How dare those liberal scientists suggest your opinions about science are wrong. How dare they promote “Darwinism” to defenseless children. How dare scientists use fancy words, such as “eukaryotes,” in their exhibits. And if you struggle to pronounce such words as you pontificate about how scientists misuse those terms, then shame on the scientists for making you display your ignorance of phonics. Asimov once wrote that some think the egalitarianism of democracy implies “my ignorance is just as good as your knowledge.” In our anti-intellectual culture—where we worship professional athletes while denigrating teachers, where cities subsidize lavish new football stadiums even as they slash school funding—it should come as no surprise that individuals such as Fox imagine their unscripted, off-the-cuff remarks at a science museum carry more scientific heft than countless peer-reviewed papers. The intuition of a real American, according to a line of reasoning dating back to the Scopes trial, is superior to the knowledge of those egg-headed scientists with all their book learning. The problem is that intuition stinks. It’s no better than blind guessing, and often worse than blind guessing. In many ways, science is the systematic demonstration that most of what you intuitively think about the natural world is completely wrong. The intuitions of most beginning physics students inform them that when two objects fall, one massive and one less massive, the more massive object should hit the ground first. Wrong; intuition fails. Beginning chemistry students assume that as you alter energy in atoms, the energy levels should change in a continuous, smooth curve rather than in clunky, stair-like jumps. Wrong; intuition fails again. Beginning biology students might look at a bird’s wing and imagine they see design—perhaps even an intelligent design, an avian engineering plan, a created limb expressly designed for the purpose of allowing birds to fly. Wrong again; gut feelings are not information. One thing I’ve learned studying science is that if I feel something is true, it’s probably wrong. Feelings and intuitions just do not get you very far. In one of the greatest reveals in movie history, Darth Vader says to Luke, “I am your father.” This is followed by one of the worst moments in movie history, when Vader suggests as proof of his claim: “Search your feelings, you know it to be true.” Huh? How would an inventory of Luke’s feelings help? Everyone else has to go on the Maury Povich show to determine paternity using DNA, but since the Force is strong in Luke, he gets to use his magic intuition. Magical thinking similarly permeates Fox’s commentary on a display of the famous fossil Tiktaalik, shown below in a more fleshed out form. ‘Today tetrapods include reptiles, birds, and mammals like you.’ [Fox here makes a stink eye for the camera that would make any teenager blush.] Maybe they always had feet like that. Maybe that’s the way they were made--with feet … It’s not like their fins fell off and then they grew feet. That’s what they want you to believe… Do you know how complex feet are?!? Of course, no scientist argues that the fins of an adult fish fell off and articulated limbs sprung into place, as in some bad sci-fi movie. This straw man caricature is camouflage for what Fox is really saying--that tetrapods were created. Created by God as they presently are, with all their limbs already in place. People have a right to think this, of course, but there’s no need to first attack science museums. The Field Museum is one of the world’s best places to rid oneself of the mistaken notion that animals were supernaturally created in their present forms. So the real lesson of Fox’s “audit” is not any science-shattering observation she makes, but the spectacle of her own inability to see what is right before her. There is no insurmountable barrier to knowledge except stubbornness. The real tragedy here is a person going to a museum that shows so much of the beauty and majesty of nature, and being able to react only in self-righteous rage.